Blake Landscapes is growing and seeks new employees for the 2018 landscape season. The company will hold a hiring day this Saturday April 14, from 9 a.m.-1 p.m., at the Blake Landscapes operations center in Leesburg. Requirements: desire to work hard and make money! Blake Landscapes is an e-Verify employer, so interested candidates should bring two forms of government issued identification to the hiring day. Spanish-speaking candidates are encouraged to apply. Bilingual and clean driving records are big pluses! Blake Landscapes is the leading local landscape maintenance and installation provider and is a great choice for anyone interested in learning the business. Excellent candidates include but are not limited to: high school graduates seeking a first job, military recruits looking for temporary employment, and college student seeking summer work. Experience is preferred but not required, with pay ranging from $10-$15 per hour depending on experience. For more information, contact Skye Hissey at (703)777-5596 x. 108 or just stop by the office this Saturday. 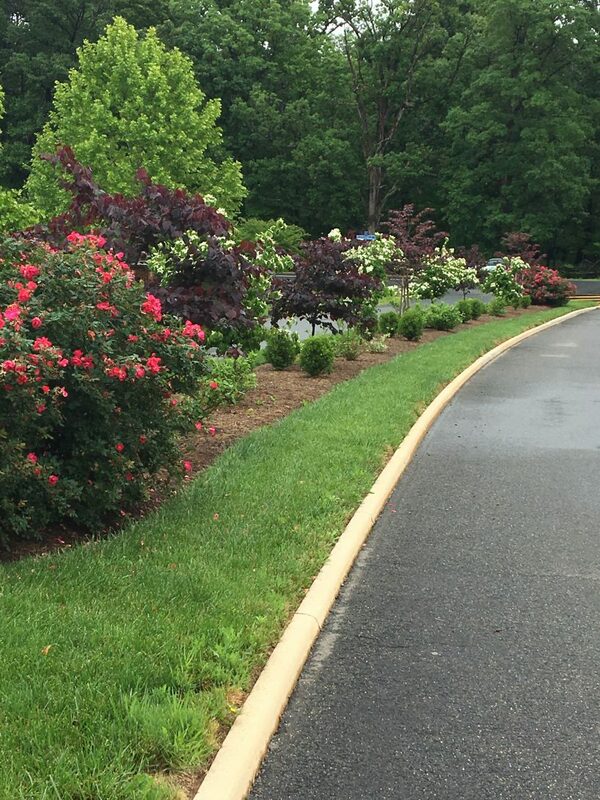 Blake Landscapes is located at 19473 Samuels Mill Court, just off Cochran Mill Road near the W&OD Trail. Below are photos of just a few of the downed trees we’ve encountered in the aftermath of last Friday’s wind storm. 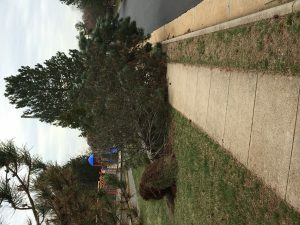 We’re dealing with damage at virtually all our properties, including the Dulles Toll Road where hazardous tree removal is a huge part of our job. The pictures below were taken in homeowners association communities, where tree damage is a growing problem. 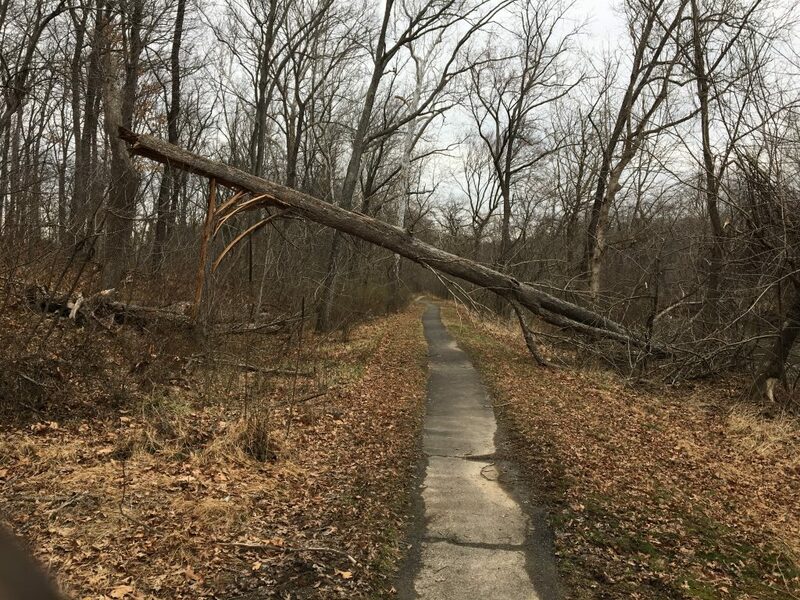 As trees growing near homes, walking paths, and recreational areas get bigger, so does the danger they pose. Blake Landscapes recommends hazardous tree assessments for all HOA’s as well as for commercial properties and any public area. 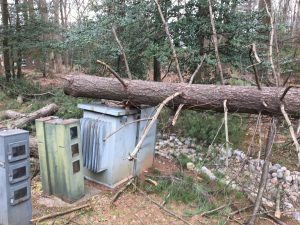 If you choose to get such an assessment done in preparation for the next big weather event, make sure the individual doing the assessment is an ISA Certified Arborist. Feel free to contact us for more information. The Loudoun Soil and Water Conservation District (SWCD) announced recently that it is accepting applications for riparian buffer planting projects. 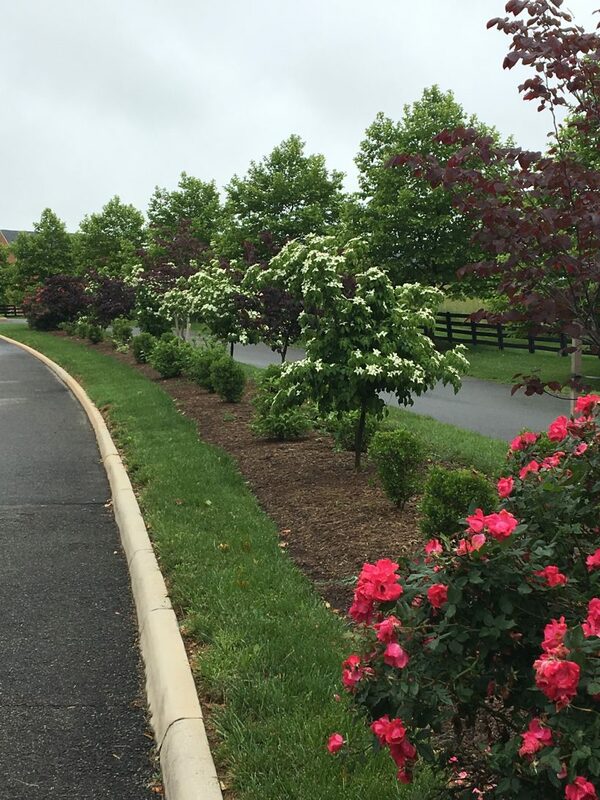 The deadline for applications from homeowners, businesses and home owner associations is March 15, with fact sheets, the application and plant list available on the Loudoun SWCD website. Loudoun SWCD Urban/Ag Conservationist Chris Van Vlack says riparian forest buffers have many benefits. 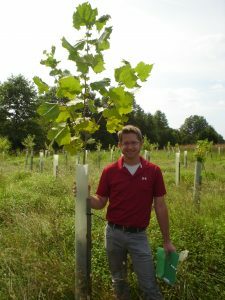 Loudoun SWCD Urban Ag/Conservationist Chris Van Vlack with a sycamore tree planted a year-and-a-half earlier in a riparian forest buffer zone in Ashburn. The Penn State University Extension emphasizes that fish are among the wildlife species supported by riparian buffer zones. The SWCD program incentivizes participants in the riparian buffer program by providing reimbursements of up to $7,000 per acre for materials and labor. Van Vlack adds a word of caution, however. Using a property on a large pond south of Purcellville as an example, Van Vlack says areas around water that don’t have existing forest cover make excellent planting sites. If you live in a house with a fenced-in yard, particularly if it’s board-on-board fencing, you should inspect it for a small problem that could become a big one. 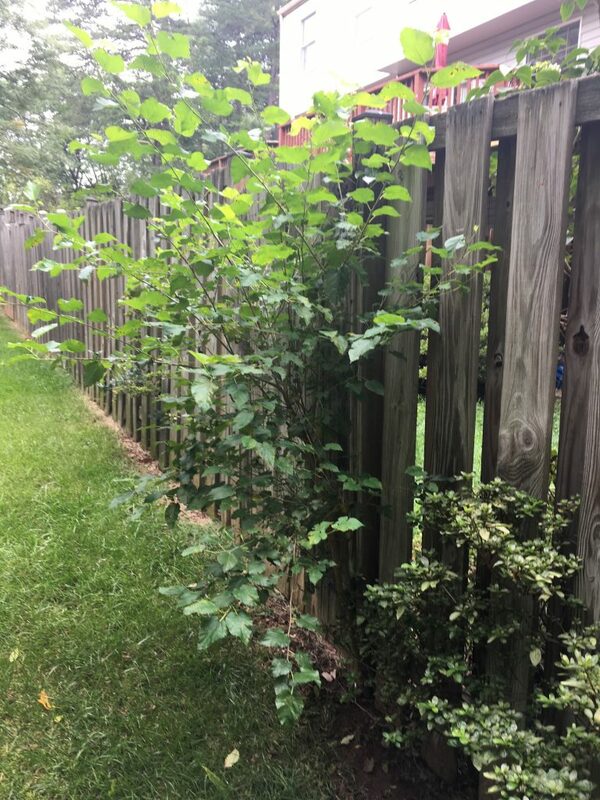 This is something that I’ve noticed a lot this summer in a few of the communities we service: trees germinate in the small space between the inside and outside rows of boards of the board-on-on board fences commonly used for privacy at townhomes in the Northern Virginia area. 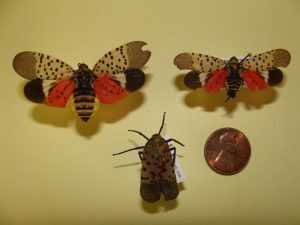 These “volunteer” trees – most often mulberry – start off as little more than a weed. This seedling in Sterling could eventually become a large tree that will destroy the fence. But if allowed to grow, the trees get big and can quickly destroy the fences that once provided shelter for the tree in seedling form. 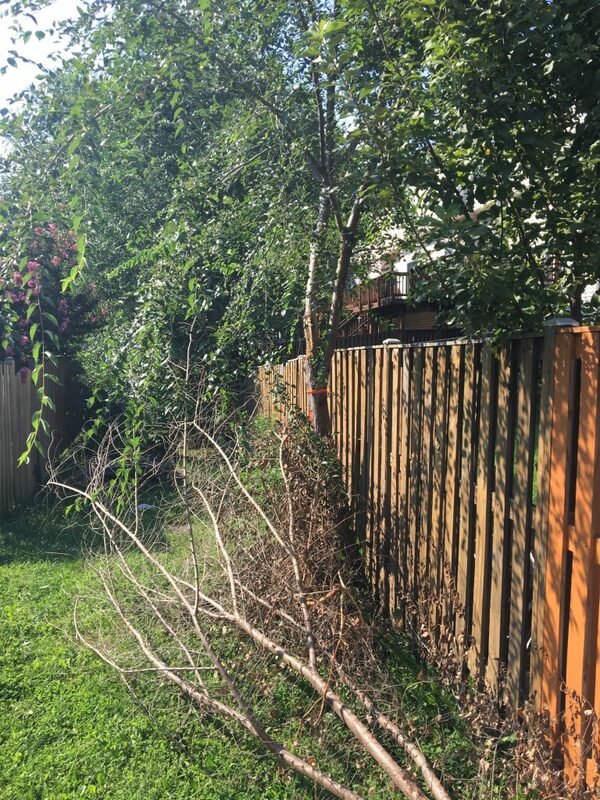 It’s too late for this Leesburg homeowner, who will have to have the trees removed and will likely have to replace at least part of the fence. Perhaps the homeowner doesn’t often go into the common area behind his or her house, so the small tree goes unnoticed. Meanwhile, personnel from the community’s grounds maintenance provider trim along the backs of the townhouse fences so that should take care of the weed tree before it becomes a problem, right? Because the trees are growing between the boards, it’s impossible for the grounds maintenance team to cut them with trimmers without damaging the fences. 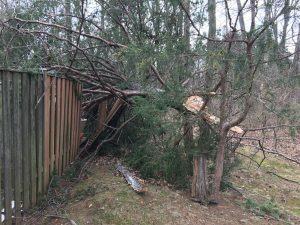 As they grow, the trees not only damage fences but can make it hard to even walk through the often narrow corridors of common area between townhouse back yards. This common area has become almost impassable because of volunteer trees growing through fences. 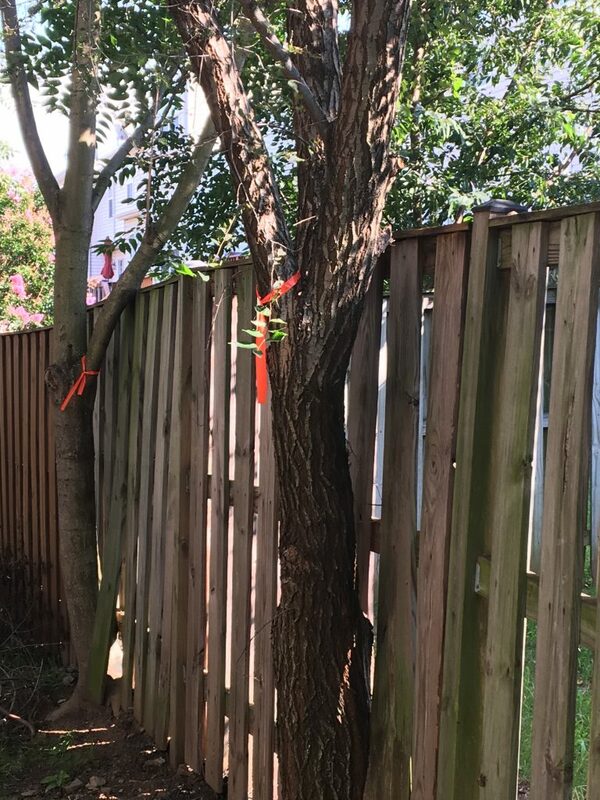 If you already have a large tree growing through your fence, it’s best to consult a professional arborist who has the expertise to remove the tree without further damage to your fence. If you’re fortunate enough to catch the tree in seedling form, it should be easy to cut it down with hand pruners or loppers. Better yet, spray the foliage with a non-selective herbicide like Roundup, wait for it to die and then cut it down. Even if you do the latter, you should still inspect your fence several times a year for any new seedlings and for any that are trying to make a comeback after being cut down. Don’t let a small volunteer tree become a big problem that will wreck your fence and possibly cost you thousands of dollars! 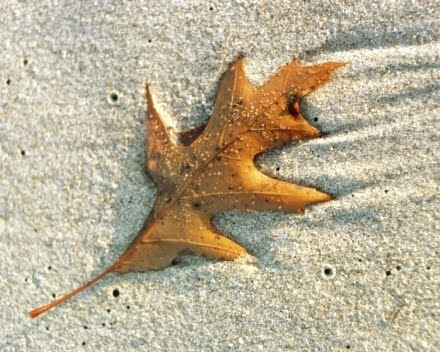 July is a popular month for beach vacations, relaxing by the pool and taking a summer break, but it’s also the best time to start planning your fall lawn and landscape projects. Fall will bring ideal conditions for many types of lawn and landscape projects, including seeding, new sod, soil amendments and planting trees and shrubs. But the window of opportunity is small. For example, seeding lawns has the greatest probability of success if done between about September 18 and October 10. September and early October are great for planting evergreen trees, but if you wait much later than that the likelihood of them surviving the winter beings to decrease. It pays to have your project completely planned out before September so you or your contractor can take advantage of prime planting times. 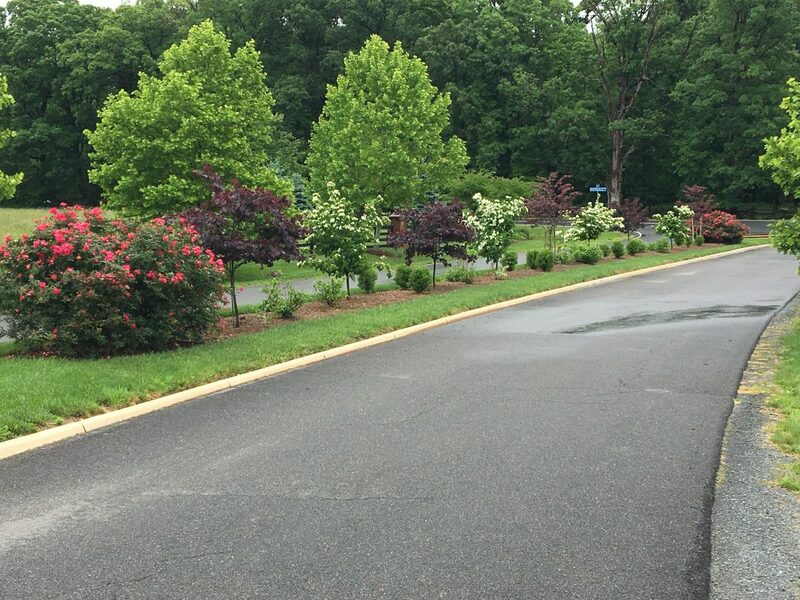 July is also a slow month for landscape professionals, as compared to spring and fall months, making it easier for us to quickly turn around designs and estimates. Requesting that price quote now will give you more time to think about what you want to do with your landscape. You might go through 2-3 plans before you decide on the one you like, and beginning the process now will help you avoid having to make up your mind under pressure. 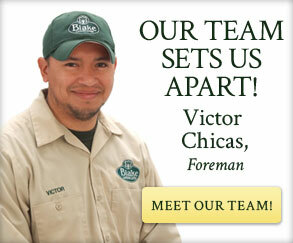 If your planned project includes an element of hardscape (patio, walkway, retaining wall, etc.) go ahead and get that done before the end of summer so new plants can go in around it in early fall. Have a great summer, but don’t forget about your lawn and landscape and please contact us as soon as possible if you need help! Last week got off to an intense start when we were called in for emergency tree work on the Dulles Toll Road. A tree had fallen on the sound wall near Tyson’s Corner and was hanging precariously over two lanes of eastbound traffic. In order to remove it we had to mobilize a traffic control crew to close the two lanes along with a crew of highly skilled arborists. The tree crew brought a crane and got the job done in about an hour, restoring normal flow of traffic and – most importantly – with everyone going home safely! 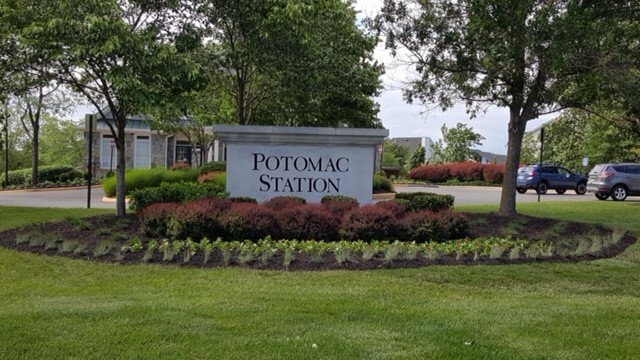 We recently renovated the landscape surrounding the community monument sign for one of our newest customers, Potomac Station HOA in Leesburg. 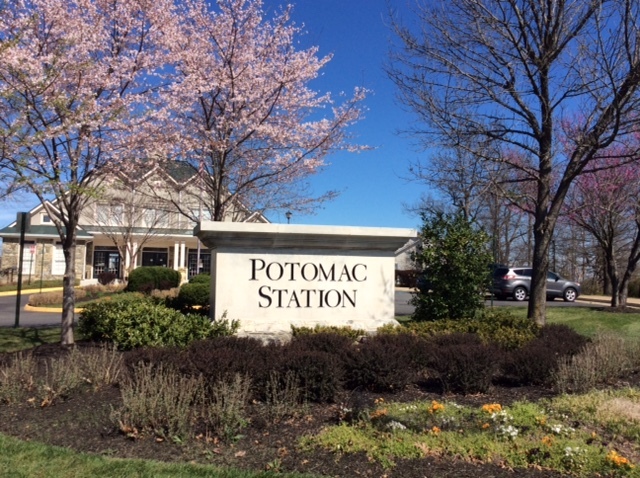 The sign renovation was the first of three phases of a general landscape renovation of the Potomac Station community center, located at the intersection of River Creek Parkway and Fort Evans Road. The project was designed by Blake Landscapes landscape division manager Dave Sine. Phase Two got underway immediately upon completion of the sign renovation, and phase three is expected to start soon. Tree worker safety along with climbing and working in trees. 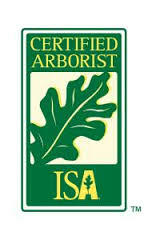 Following passage of the test, Arborists must complete yearly continuing education units to maintain the certification. Blake Landscape Vice President Brad Yurish, also a Certified Arborist, says the continuing education is one of the most important elements of the certification. “It keeps you up-to-date on industry standards and new developments,” Yurish said. He also pointed out that many landscape maintenance and installation contracts require selected contractors to have an Arborist on staff. 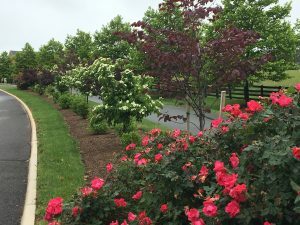 For Coughlin, the ISA credential follows his certification last year as a Virginia Certified Horticulturist by the Virginia Nursery & Landscape Association.